Brazil Manufacturing PMI rose marginally to 47.2 in July from 46.5 in June, marking 6th consecutive month of manufacturing activity in contraction (below 50.0), with five of these months PMIs statistically significantly below 50.0. 3mo average though July is now at extremely low 46.1 against 3mo average through April 2015 at 47.3 and 3mo average through July 2014 at 48.9. China Manufacturing PMI fell to 47.8 in July from 49.4 in June, signalling deterioration in sector performance and marking fifth consecutive month of contraction in the sector. This is the worst reading in the index since July 2013. 3mo average through July is now at 49.2 against 49.7 3mo average through April 2015 and 50.6 3mo average though July 2014. India Manufacturing PMI was the only PMI for the BRIC economies that stood above 50.0 in July, rising from 51.3 in June to 52.7 in July. This marks 21st consecutive month of above 50.0 readings. 3mo average through July 2015 is now at 51.7 (barely at statistical significance line) against 3mo average through April 2014 at 51.5 and 52.0 3mo average through July 2014. 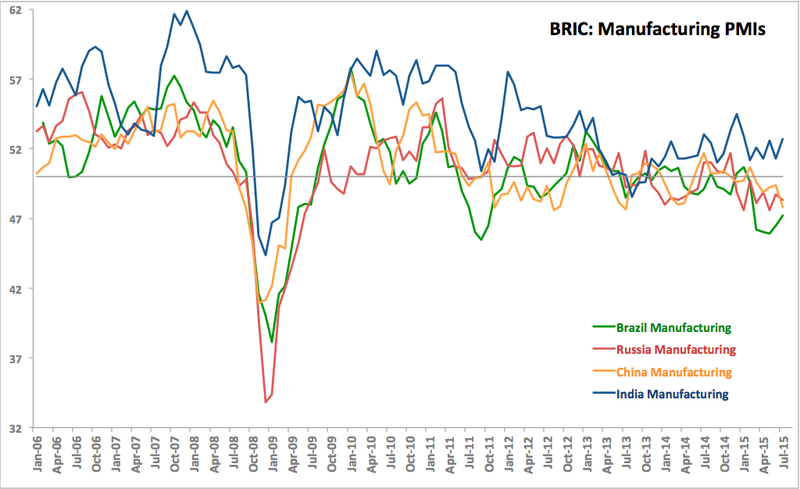 Three out of four BRICs economies have now been in Manufacturing activity decline territory every month since March 2015. Based on 3mo averages, growth in May-July 2015 is down compared to same period in 2014 in all four BRIC economies. 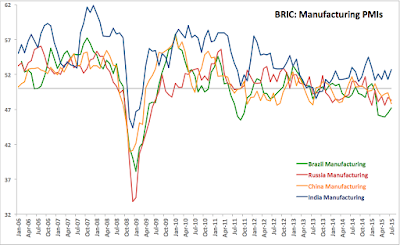 Summary: BRIC manufacturing remains deep under water, with three of the four economies struggling with contracting manufacturing sector activity. Which is consistent with poor global trade performance (http://trueeconomics.blogspot.ie/2015/08/2815-global-trade-welcome-to-economic.html).